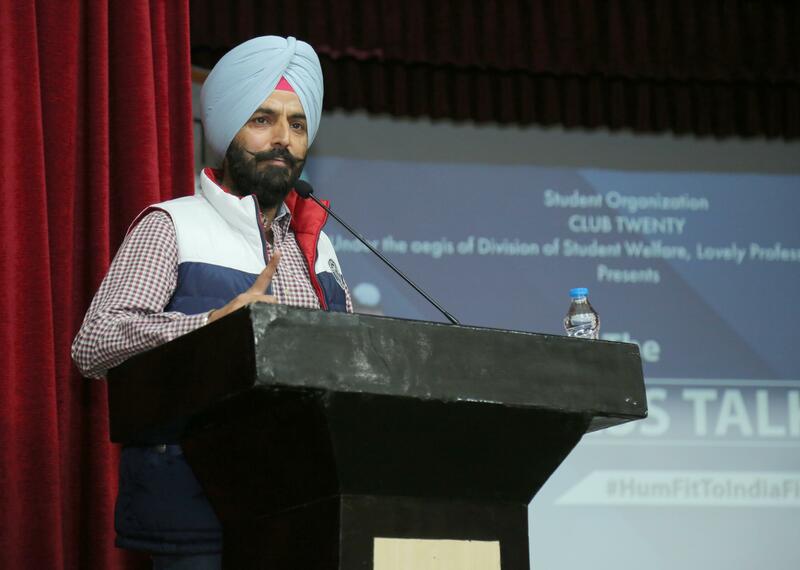 Jalandhar: Arjuna Awardee Hockey Legend Rajpal Singh (former Captain of Indian Hockey National Team) reached Lovely Professional University (LPU), today, where he interacted with LPU students and forwarded them important fitness tips and nationalist views. Occasion was ‘Fitness Talk’ organized at Shri Baldev Raj Mittal Auditorium by one of the 150 student-organizations ‘Club-20’, working under the aegis of Division of Student Welfare at LPU. Presently DSP with Punjab Police, Youth-Icon Rajpal Singh inspired LPU students be fit on all the levels, be it physical, mental or emotional. Motivational speaker, certified marathon trainer, former sea-captain & a corporate executive Siddarth Choudhary accompanied DSP Rajpal. Both the elite guests were welcomed at the Campus by LPU Director General Er HR Singla. Equating LPU with University of Birmingham (United Kingdom) in the matter of infrastructure, DSP Singh shared that the people of Punjab are fortunate in having a world class university in their own state and easy access. Interacting with students he advised them to build their own capacity; be better than the yesterday’s performance; develop habit of having good-food; never be emotionally weak as this usually compels a person to take wrong-steps; do not get tired mentally, never stop, and go on and on. Philosophically he shared: “Life is itself a great marathon and we ourselves have to learn how to be fit to run, win or lose it. One can be motivated by anybody, even by a rickshaw-puller who keeps on plying plies for his family and life. So, ever try to feel unique instead of being a mere part of a crowd. Every action needs hard-work and fitness, keep on trying for the same on emotional, mental and physical levels.” On asking how on basically being a sportsman he is feeling in police decorations, DSP Singh answered that except colour of the dress nothing has changed from within. “First, I used to play for the country wearing blues, and now I am dressed in the khakis. Job remains the same- to serve the nation, the spirit remains the same, only the field has changed”, shared DSP Rajpal. Long distance runner in the country, Siddarth Choudhary shared much about ‘intensity of training’ with students, particularly physical education students, and advised them to be ever cautious about their diet, rest and recovery during and after training. Health is an asset for all, if one is healthy he or she can study and act well. Highlighting, Rajpal led the Indian hockey team victory in the Sultan Azlan Shah Cup in 2010. Under his captaincy, India also won their first ever Commonwealth Games medal; and, an Asian Hockey Champions Trophy title by defeating Pakistan in the final in 2011. In the same year, Rajpal Singh was honoured with the Arjuna Award for his excellence in the field of hockey.